Mezco‘s Living Dead Dolls line typically specializes in scary versions of baby dolls. Typically, they amp up the already creepy “uncanny valley” into something monstrous that’s meant to terrify. But in the case of their latest, the only folks who need to fear are evildoers and jewelry store owners. 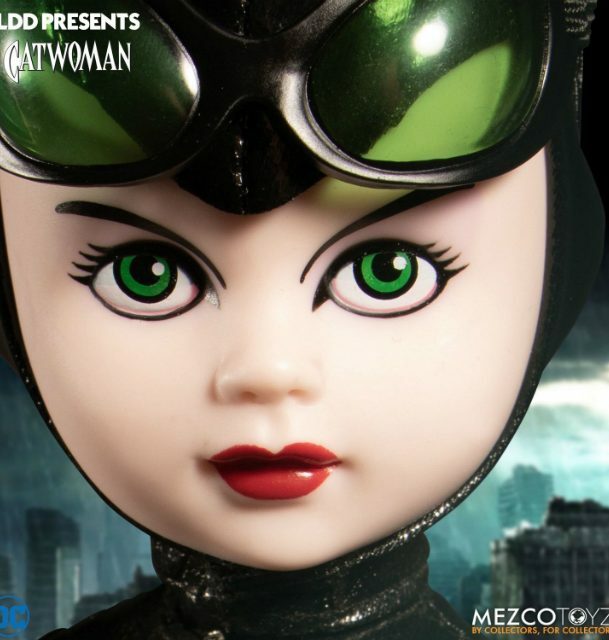 The new Catwoman Living Dead Doll gives Selina Kyle a baby-faced makeover, complete with comics-accurate costume. Maybe one day, the live-action movies will take a page from the Marvel playbook and do the comics costume right. Sadly, Anne Hathaway and Halle Berry’s big-screen costumers both failed us on that score. And if leaked images are accurate, Gotham‘s season finale won’t get us quite there either. But Mezco nails it, even to the point of making the zipper functional and the goggles removable. If your other Living Dead Dolls get any ideas, she can take them down with her included bullwhip. Per Mezco, “LDD Presents DC Universe: Catwoman stands ten inches tall and features five points of articulation. She comes packed in a window box, purrrfect for display.” You can preorder her now for $50 directly from Mezco’s online store. Previous licensed Living Dead Dolls include A Clockwork Orange‘s Alex DeLarge, the Tim Curry Pennywise the Clown, those creepy twins from The Shining, and Evil Dead 2‘s reluctant hero Ash. They’re all dangerous characters, but in general we’d feel safer with Catwoman overall. Ash means well, but he’ll probably get you killed even as he somehow survives. 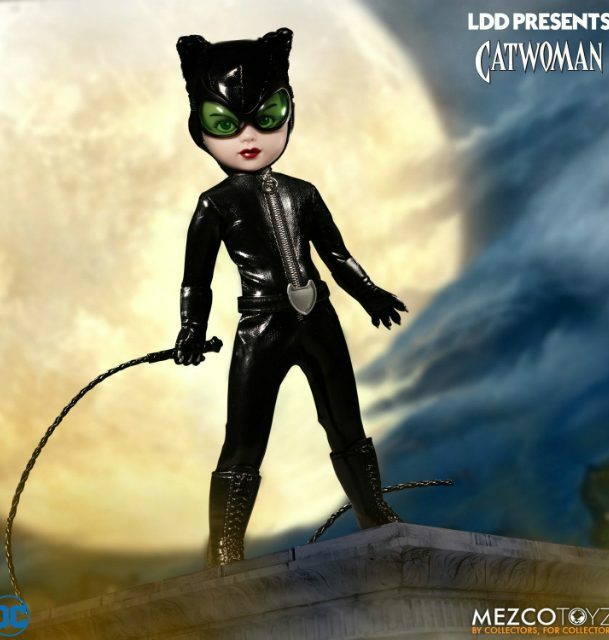 What do you think of Catwoman’s new toy form, courtesy of Mezco? Is it plastically purrfect in every way, or just a bad kitty? Scratch out your thoughts in our comment section below.